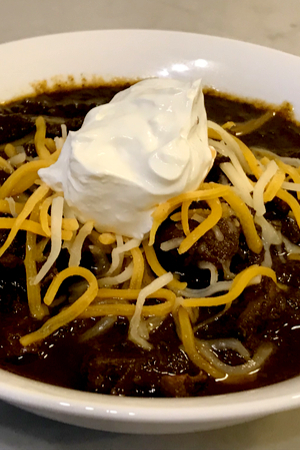 When I had a chance to visit friends in Texas many years ago, it was suggested that I order a bowl of Texas Chili at a local restaurant. It was a staple menu item at the family owned restaurant and it had been featured in several magazines and television shows. A yummy bowl of Texas Chili – aka Bowl of Red. When I took a look around at the tables in this tiny establishment, I noticed everyone had Texas chili on their tables. But because it was the middle of summer, chili didn’t even sound appetizing. But with a little prodding of my friends, I ordered it as a side dish. Just like almost everything in Texas, they do things a little unique, and most often times, bigger and better! This wasn’t your ordinary chili recipe. First of all, when I ordered a cup of chili, it was actually served in a breakfast bowl. And it was filled to the rim! 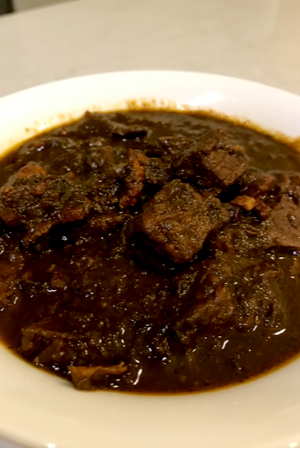 Authentic Texas Chili calls for chunks of chuck roast rather than ground beef. Secondly, I always had chili that was made of ground meat. Of course, it sometimes a variety of meat, but it was always finely ground. There were huge chunks of meat that poked through the top liquid of the bowl. My first bite of Texas Chili was in San Antonio, Texas. It was filled with huge chunks of meat that literally fell apart when you took a bite. Authentic Texas chili is made with a base of pork fat for browning of the meat. I instantly fell in love. Every chili that I had ever tried was always full of ground meat. The best that I ever had used a combination of ground sirloin and ground sausage. But authentic Texas Chili was different. There were large chunks of tender meat that filled the bowl. I had to know what the delicious and filling meat was that filled the bowl. So when I asked the chef, he explained that it was chuck roast. What? Chuck Roast? I have had chuck roast several times, but never in chili. I usually made it for a pot roast and potatoes. 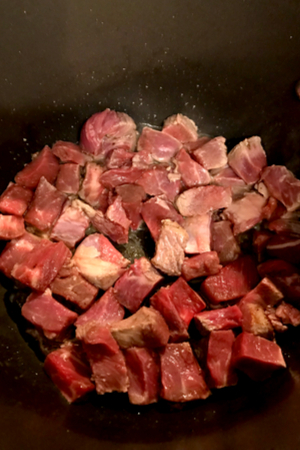 Chunks of beef being browned in bacon grease. 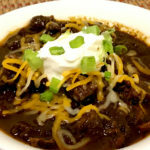 But now, I was given inspiration for the frozen chuck roast in my freezer – Texas Chili! So in my quest to make Texas Chili, I decided to go to the experts and see if they would help me with the recipe. As a Midwesterner, I was shocked to find NO Tomatoes and NO Beans in this recipe. I grew up with Midwestern chili and it always had chunks of diced tomato and beans throughout the soup. And sometimes even chocolate! Ancho chile peppers – soaked and de-seeded and ready for the food processor. I was okay with no beans, as I would always try to eat around them anyway. However, I thought a staple ingredient in chili was tomatoes! To much of my surprise, authentic Texas Chili didn’t include any diced tomatoes! Instead, it uses dried chiles to thicken and flavor the chili. Lucky for me, we have a local grocery store that stocks dried chile peppers! And when I tasted the chili – I was in love. There was absolutely nothing else that needed to be added to this Texas chili recipe. You can use almost any dried Chile peppers for this recipe. It all depends on the amount of heat that you like in your Texas Chili. 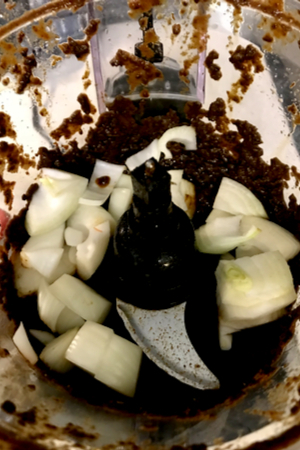 Chili paste and onions in our Hamilton Beach Food Processor. We prefer Ancho chile peppers for this recipe. The heat level is typically at a medium level and they are easy to find in the produce section. However, you can choose any dried peppers that you have can purchase. Or of course, you can substitute dried chili powder(s) for this recipe. Just be aware, that the dried chiles provide so much flavor to the Texas Chili. If you decide to use ground spices, you will need to add a variety of spices to make up for the complex flavor of this Authentic recipe. I was sitting at the table, ready to order my meal, when the server came over. Texas chili ready for your favorite toppings! Just like I always do in a new establishment, I let the other guests order first. This gave me a chance to see how things worked in this specific restaurant. And everyone, I mean everyone ordered a ‘Bowl of Red’ as their side dish. I was so confused because I thought everyone at the table would order the famous Texas Chili. It wasn’t until the bowls were brought to the table until I realized that a slang term for Texas Chili was Bowl of Red. I just laughed and realized that there is so much to learn about cuisine in other cities, states, and countries! Authentic Texas Chili made with no tomatoes and no beans. This ‘Bowl of Red’ will have you begging for more! 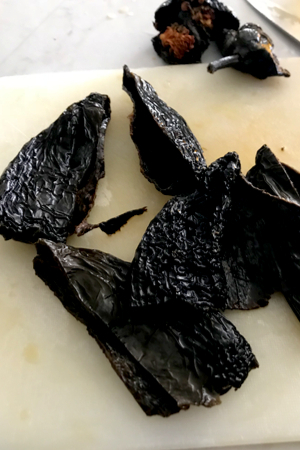 In a large skillet toast dried chiles just until fragrant. Place in hot water for 45 minutes to become pliable. Remove the stem, seeds and ribs of the chiles and place in a food processor or blender. Add the cumin, black pepper, salt and ½ cup of water. Pulse on high until the chiles are completely pureed. Cut the onion into 8 sections and add to the food processor/blender. Pulse until onions are diced. Cut bacon into small strips and dice. 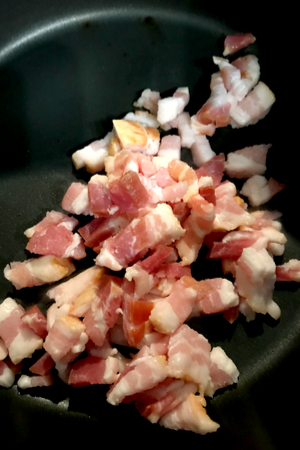 In a large stockpot over medium-high heat cook bacon until medium crisp. Remove bacon from pot and set aside, leaving grease in the pan. Add the diced chuck roast to the hot pan and until browned on all sides. Add the garlic and chile and onion paste. Stir in the beef stock and water and stir well. Return bacon to the pot and stir. Bring the pot to a light boil and reduce heat to a small simmer. Simmer for 3 to 4 hours, stirring frequently, until cooked down and thickened. Follow steps 1-3 from above to make the chili/onion paste. Place Instant Pot on Saute. Once hot, add 1 teaspoon olive oil and add in the diced bacon. Cook until crisp and remove with slotted spoon, leaving the pork fat in the liner. 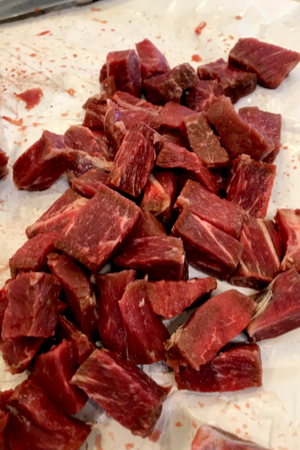 Add diced chuck roast and brown on all sides, working in batches if necessary. Remove beef and set aside. Add 1 cup of the water and deglaze the pot. Turn Instant Pot OFF/Cancel. Place the beef, bacon, and chili paste/onion mixture back to the Pot. Add 1 1/2 cups beef broth and stir. Pressure Cook/Manual on HIGH for 30 minutes. Once pressure cooking time expires allow for a Natural Pressure Release for at least 10 minutes. Release any remaining pressure. Optional - Continue to saute until desired thickness is reached.